Boston Food Bloggers: Updates and a Biscoff Spread Giveaway! Updates and a Biscoff Spread Giveaway! I've been neglecting the site while working a full-time job by day and pretending to be a rock star by night. I still exist, and I still have lots of plans for this site. My job situation is changing, so I might have more time to devote to the site soon. Everything will be updated eventually. Ok, onto to the fun stuff...a giveaway! 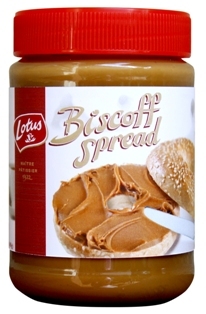 A new treat from Lotus Bakeries is coming to Boston-area Roche Bros. and Market Basket this month: Biscoff Spread, "Europe's Alternative to Peanut Butter." Invented by a Belgian mother, Els Scheppers, it's a nut-free creamy spread made with no artificial colors, flavors, or preservatives. Scheppers defeated 2,000 contestants on a Belgian prime time reality TV program, “De Bedenkers” (“The Inventors”) to win the competition with this recipe, which contains Lotus Bakeries' Biscoff Cookies (which you've probably tasted if you've ever been on a Delta flight). Good luck! You have until Friday, March 11 at noon to enter! The photos in this post were supplied by Lotus Bakeries. The five prizes are being provided by and will be shipped directly by Lotus Bakeries. BostonFoodBloggers.com received a product sample but did not receive any monetary compensation for this post. At times, BostonFoodBloggers.com works with brands to put together giveaways or events; all sponsorships, advertisements, freebies, etc. will always be fully disclosed on BostonFoodBloggers.com.